This simple information graphic depicts various forms of privilege and oppression as a set of multiple spectra (lines) that all intersect at a central point. 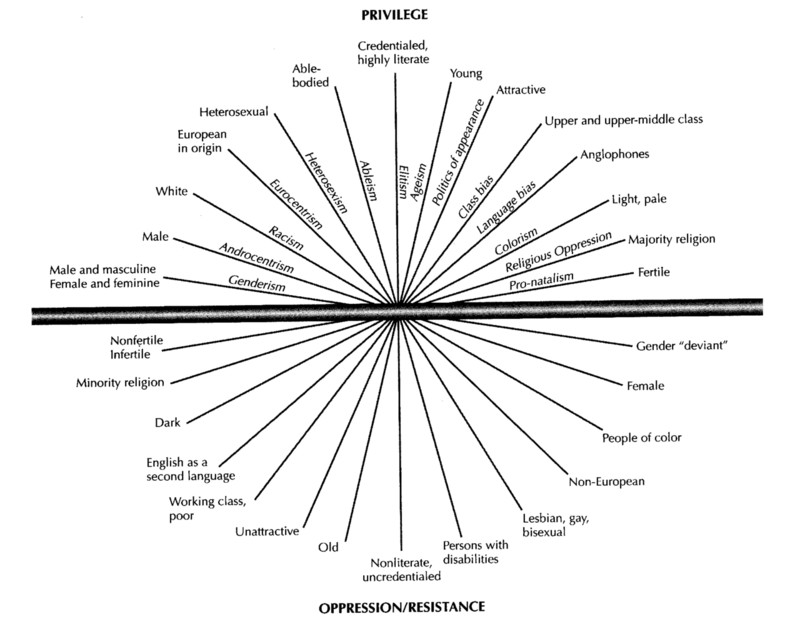 The ends of each line is labelled with the “privilege” on the top half of the graphic and its corresponding “oppression/resistance” on the bottom half, while the line itself is labeled with the associated “-ism”. While the graphic doesn’t use the term, it can therefore be considered a visualization of kyriarchy. the graphic creates a privileged/oppressed dichotomy without acknowledging the fact that both privilege and oppression are context-dependent. For instance, in assigning youth the privileged position along the ageism axis, it makes invisible the various oppressions of adultism. This is why, in discussions of privilege, it is vital to remain cognizant of the difference between categorical and non-categorical privilege. It is, of course, arguably impossible for anyone to design an info graphic that is 100% complete. Similarly, I think it’s foolhardy to attempt to deconstruct all this incredible complexity without appropriately scoping our conversations, defining our terms, and in the process excluding certain concepts, experiences, or identities from a given (but not every) discussion. And even if it were possible, I don’t think it would be very useful. Dichotomies are genuinely useful, even necessary. We use them all the time to make sense of the world around us. In fact, dichotomies themselves conveniently come in two mutually exclusive varieties! These are: true dichotomies, and false dichotomies. Many people often get very (and I do mean very) angry at me for using tools like analogy and bisociation to make legible various forms of oppressions (“-isms”) that they do not often understand. For instance, there seems a large contingent of the trans* community (as though “the trans community” were a monolith, which is false, of course) that seems endlessly frustrated with me for my attempts to raise awareness of sexism and its intersection with domism by borrowing from trans experience. Rather than conceptualizing privilege and oppression as a categorical dichotomy, a static and universalizing force, what if privilege were conceptualized as difference plus obligation? That is, since we are all “multiply privileged and multiply oppressed,” in those areas where we have privilege, we ought also couple it to an ethical obligation to use that privilege in the service of those who do not have it. By the same token, what if oppression were conceptualized as difference plus creativity? 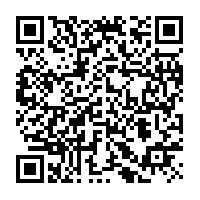 Those who resist oppression are inherently creative. Even in acts of destruction, those who resist oppressions are creating spaces for difference, sometimes simply by virtue of their bold acts of survival. Think about it: privilege is emptying. For instance, what does it mean to be “white”? It means to be not a person of color. What does it mean to be male? It means to be not female, for that would be “unmanly”! I think that if we were able to internalize a fluid understanding of privilege and oppression, if we could queer the very concepts themselves, we could reliably gain the power to imagine people complexly, and thus treat one another far more humanely than we are often rewarded for (not) doing today.